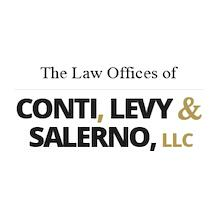 The Law Offices of Conti, Levy & Salerno, LLC in Torrington provides general legal services to clients in northwest Connecticut and southern Massachusetts. With more than 60 years of combined experience, the lawyers at the law firm are prepared to handle virtually any case in their respective practice areas. Clients of the law firm appreciate its ability to obtain results for them in a timely and cost-effective way, as well as the personal service the firm provides. The Law Offices of Conti, Levy & Salerno, LLC provides quality expected of a large law firm, with the responsiveness and client service that clients typically associate with a small firm. Each client works directly with his or her attorney, who is supported by experienced professional staff members. The law firm is committed to achieving positive results for every client by providing caring counsel and results-oriented advocacy. Whether it involves family law, a criminal charge, a motor vehicle accident or another legal problem, you can depend on The Law Offices of Conti, Levy & Salerno, LLC to do everything it can to achieve your goals. To schedule a free initial consultation concerning your legal matter, call The Law Offices of Conti, Levy & Salerno, LLC at 860-866-4637 or toll free at 866-970-1181.